After his trip to Amy J's Homestead for training the other day, Rich decided that today was going to be our herd health day. He had herded the girls into the barn before Pressley arrived and we were ready for toenail trimming and Mango's CDT booster shot. Easier said than done. The three of us held Firenze first and while she didn't exactly like having Pressley hold her while Rich lifted a foot to check and clip overgrown toenails, she didn't fight us. The job was relatively easy. Leezza was the next one to be caught and she was really calm while her nails were checked and trimmed. Rich held Leezza while Pressley lifted each foot and I trimmed. Took was next on the list. Catching her was relatively easy but lifting those feet was another story. She has had this proceedure done many time before, but for some reason she wanted no part of it this time. We managed to get her fore feet trimmed but she kept kushing every time we tried to lift a rear foot. Ever had a pregnant 175 lb. alpaca sit down on your foot and refuse to budge? That's what she insisted on doing and we had to give up on her back feet. Rich and I will try again later this week when she forgets this experience. Mango wanted no part of the nail clipping and really fought us, leaping and dodging around, even as Rich held her head and neck. We gave up since we had the shot to administer and deemed that a more important procedure. We harnessed up she and Leezza and took them for a walk around the pasture and outside and around the woodshop. Both young girls were led easily around the yard and back into the pasture where Mango got her shot. Rich held her, Pressley separated the fleece and I injected the medication. Rich and I went down to Columbus last night and had a family pizza night with my brother, his wife, my nephew, daughter, Amy, and son-in-law, Steve and assorted grandkids and others. 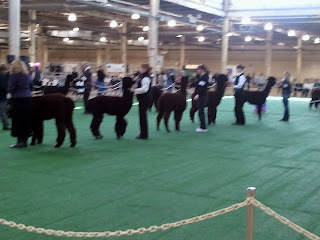 This morning we spent several hours at the Best of the US Alpaca Show at the state fairgrounds. It was a great learning experience and gave us the opportunity to meet and talk with several other alpaca breeders from the state. 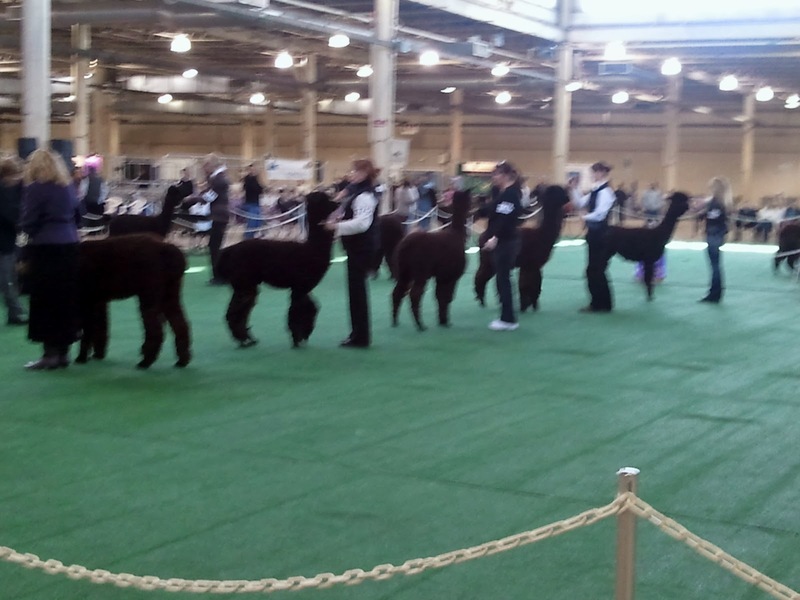 One of the most impressive sights was to see dozens of alpacas lined up to walk into the show ring. I took this, not very clear, picture of the beautiful black huacayas in the ring with my cell phone camera. The next time I will remember to bring my good camera! Rich and I met Joy Mitchell of M-R Alpacas in Wakeman, Ohio which is not far from us. She gave us some important information to consider when we reach the point where we will be selecting sires for breading with our girls. She also kindly put together a packet of four of their very handsome sires for us to consider. Joy answered many of my questions concerning fiber processing and showed us some adorable stuffed animals with felted alpaca costumes. I feel certain that we will be calling on her in the future. Closer to home we met Patrick Cassese from Glengary Farm Alpacas in Plymouth, Ohio. He and Robin couldn't have been kinder as they patiently answered our questions. Robin and I made a connection since she had substituted in the past at the school where I teach. We both know many of the same teachers well. They invited us over to visit and we will do so in the near future. They have some beautiful animals. The other day, Rich spent a morning at AmyJs Homestead Alpacas where we purchased our girls. Joseph gave him a crash course in toenail clipping and administering shots. The folks at Amy Js have been wonderful and patient mentors to us. Shearing day is scheduled for mid-April and we will transport our girls over there for shearing. We have learned so much from them and look forward to continuing the association. All-in-all this has been a very productive weekend. Tomorrow when Pressley comes over we will be attempting to trim Took and Mango's toenails for the first time. Look for the report on that endeavor later.